“It’s not just a race, it’s an Adventure!” and yes, the first running of the New England Superhero Scramble was one adventure after another! 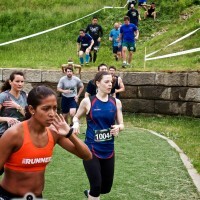 Also see our Team Review, and submit your own race review! There were many amazing things about this event. The first time the New England Spahtens put together a team (actually two of them) for the elite, competitive wave of a race. The biggest team we’ve ever fielded, which turned out to be the biggest team Superhero Scramble has ever had. Other elements could have quickly ended poorly – the terrible weather causing delays and obstacle shut downs for a lesser race would have been a disaster, but Superhero Scramble did a fantastic job in rallying together, and working like crazy behind the scenes to make the day pull together into what, ultimately, was a great event. Starting out with our experience as a team – it was pretty clear early on that we were going to have a lot of people on the team. 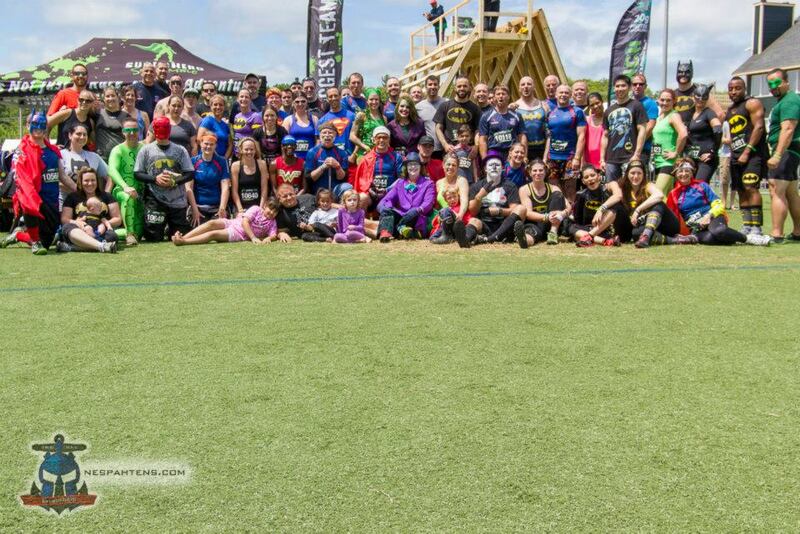 Final count was 109 people – our biggest showing to date, and officially listed as Superhero Scrambles biggest team ever (although I know a certain Panda from Florida refutes that one 😉 ). Spoils of being biggest team included a biggest team tent on site, and effectively our own wave time. As previously announced, we also had two teams of four running in the money winning Superhero Scramble Gamble wave – our guys and girls were training hard and getting themselves ready. The rest of the team had a Batman theme going on for costumes, with everything from full Joker (OMG Sandy, awesome) to Batman T Shirts and socks. It looked like a fantastic weekend was going to be lined up. Then, on Friday, it started raining. A lot. We’ve had this before – days before (or on the day of) a race is due in town, some tropical storm, or hurricane swings through and dumps torrential amounts of rain on us. 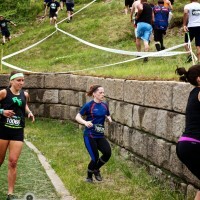 Spartan Race famously had to cancel an event, and their woes with Hurricane Irene famously gave life to the Hurricane Heat. 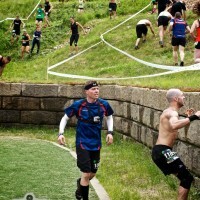 Warrior Dash had their own run in with torrential rain at this venue in 2011, and for those who raced, it will go down as one of the biggest flops I’ve ever seen at an event. The rain started on Friday, and when I hit the sack late Friday night, it was pouring. I resigned myself to running in the rain and caught some shut eye. Oh boy. It was still raining, we had 109 Spahtens coming, and my tiny little 10*10 popup was miles behind me. I was getting a bad feeling. Getting to the Sports Park – SHS had very graciously given me a pass to the onsite parking – the entire venue looked a mess. They weren’t kidding – tents were flat, flags were down, people were running around, fourwheelers were buzzing up and down the main slope – there was an air of panic and chaos, and no one seemed to know what to do, or who to talk to. A group of volunteers were hanging out, including some Spahtens, and they looked like they lacked direction – so we grabbed a couple of familiar faces, and found our way to the biggest team tent, which was indeed flattened. Lots of grunting, lifting, moving, some wooden blocks and lots of supporting sandbags and tie down ropes (and the guidance of the very helpful Thomas Mills – of Superhero Walks), we were able to get the tent *kind* of popped up, alongside our friends at Reload Fitness, and in a prime locations right by the finishers and starters chute. We had a tent (don’t cough near it, please) – we had a couple of Spahtens – and the busses arrived. SHS had wisely decided to bus people in from the Seabrook Greyhound track in NH – the same venue and parking plan Spartan uses – and one that works extremely well, and is well worth the $10 – ride share, people! Close to an hour later, they came back in – with their final results being the Mens team took fifth place team, the Womens team took third place, and I couldn’t be more pleased for them, after they worked so hard, and the team got behind them so much! Amazing job to the Reload and OCM teams who placed second and first! With the delay, we were doing a team photo at 1:30, which would now have to be without the Elite runners, who were still on the course – then lining up the regular team for the 2pm heat. Due to the number of folks they had to send out at 1pm (with the Elites) and at 1:30pm, there were some backlogs on the cours – so 2pm became 2:30pm – and we got off! The course was slippy, muddy and you had to be super careful. Immediately taking us up the most technical section of the tubing slope, turning around and coming back down, through the dropped down “gladiator pit”, then back up again – we went over the double high cargo net, then right into the trail running sections. We probably covered around 2.5 miles of super tricky, muddy as all hell trails – Amesbury has some killer hills, and we hit them several times. 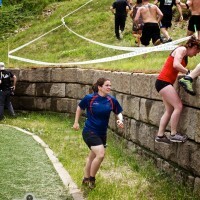 We saw a couple of obstacles in this spot – the leap of faith, ring swing, tractor drag, sandbag carry (and I LOVED the technical terrain we had for the sandbag carry! Beats a straight “go up a hill, come back” that we normally get) – before getting back into the trails. GoPro footage of the course from the POV of one of the elite racers here – I can never remember the order obstacles came in! 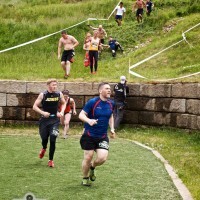 Overall, I thought they had excellent obstalces – although I think I would like to have seen more of them – the venue has a lot of single track trails that we had to navigate, with little room or chance to put an obstacle down, so they tended to be clustered and perhaps lose a bit of their impact. The “leap of faith” obstacle is one I happily burpee/spin out of every single time – water submersion not something I’m interested in dealing with. Interestingly, their low barbed wire crawl put me in the position of burpeeing out too – it being so low to the water there was no way through for me. I failed on the rings when I missed one and dropped, but had no problems with the walls – and the trenches and over/under/throughs were well done. Their balance beam obstacle was incredibly deceptive! I got 3/4 of the way and fell – frustrated that my usually good balance wasn’t enough here. Then the final stretch – climb the rope (a short wait for slow climbers here) – SHS use a much thicker rope than I’ve seen before, with knots space much further apart – I made it to the top using the pinch technique with my feet, but you could see many many people failing out on this one. Now – the finale – a giant slide to the foot of the tubing slope, and a scary looking Beast of a wall to get up … something we’d already seen elites fail off and get injured – in some cases badly. Except, the slide was shut. Shortly before we came through, the wife of the owner of Reload Fitness, our good buddy Levi, had badly broken her arm and was rushed to hospital. Many many more people had serious scrapes, cuts and bruises from the terrain they had been sliding down – turned out that the slope they had carefully groomed and layed reinforced tarps on the night before had been wrecked by the rains and the volume of people and water coming down it – the bottom portion of the tarp was trashed and removed, meaning folks slide right down into a muddy slide – the first few folks were fine, but it quickly chewed up the terrain and rocks – and mother nature won that battle. SHS made the wide – but unpopular call to shut down the obstacle, and I never got a go. The final hurdle then – the Beast – a steep wall to “walk” with a rop to pull yourself – I tried several times, but I couldn’t get a bite and my feet weren’t going to hold me on it – having watched several folks smash their faces into the wall, or wrench ankles at the bottom, I decided to burpee out, and live to race another (next) weekend. My finishers shirt and medal were duds – they had ran out of my size, and gave me an XXL, and ran out of Charger medals, so gave me a glow in the dark night wave medal – both subbed out later when they were re-supplied, but I know some people were a bit upset. 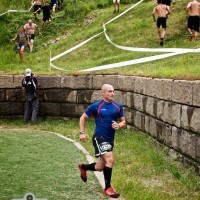 So – how do you rate an event that started late, got delayed further, closed obstacles down before people got to it, and shut obstacles down that severely injured others mid-race? Awesome. Fantastic. High praise. If *only* other events were smart enough to introduce a rain delay, rather than try and put you out there in miserable and dangerous conditions. If only other events would close their obstacles when conditions turned them dangerous. If only other events would offer discounts on race signups in apology, pay their volunteers *generously* in schwag, and run fun night waves (which I watched go out, but didn’t go with them). Superhero Scramble will come under a lot of fire for this. People felt gipped that they missed their heat times. People were upset the slide was closed, or they got scraped up, or bent an ankle on the wall – there were a couple of legit complains too – I don’t think spectators should have paid $20 to get into that festival – which really was nothing more than a food vendor, band, and view of the start/finish line – with zero course access. I would have loved to see the same kind of slide they have at their other events (landing in a pool!) – I understand they ran into venue issues with digging for that. With a bag check cost (we got to skip it – biggest team bonus! ), rumblings that folks had to ditch their open containers of water on the way in (poor move) – there were definitely kinks to work out for next time. 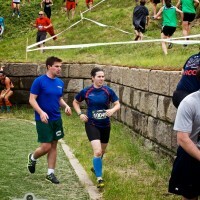 All that being said – this was a first running in New England for Superhero Scramble. They had some serious challenges that have broken other events at that venue. They handled unpopular calls efficiently, gracefully, and put on a fun event. They supported the biggest team, offered prize money that brought out some big names in the sport and had a super competitive field. The unique night wave looked awesome too, but I took a pass. 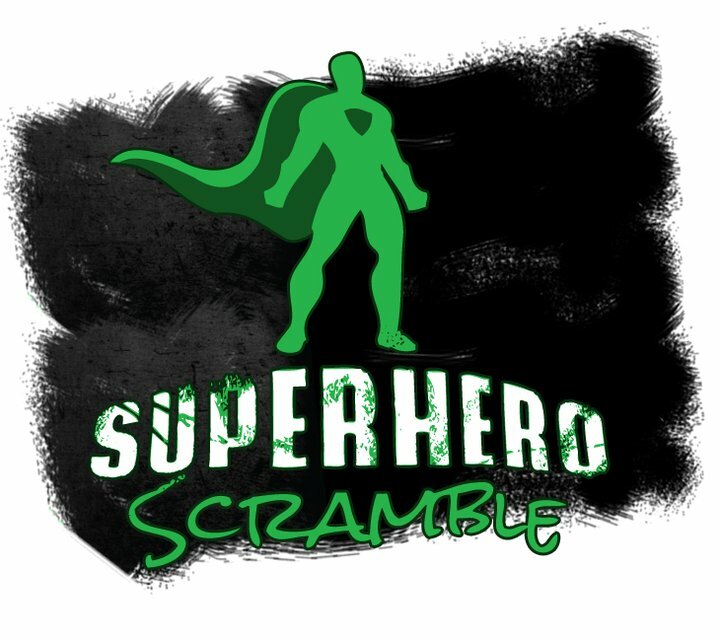 Superhero Scramble – coming back in 2014!